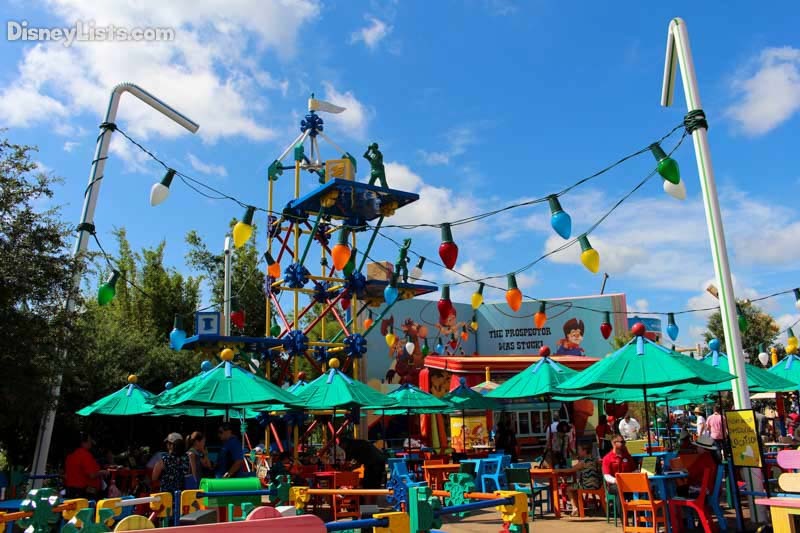 The fun extends to food as well in the new Toy Story Land now open at Disney World’s Hollywood Studios. Here, mealtime comes with a heavy helping of nostalgia, as Woody’s Lunch Box serves up classic on-the-go menu items with a creative twist. We’ve had a chance to eat at this new quick service restaurant and see for ourselves if it lived up to expectations. Catch all the details and our thoughts below. Toy Story Land is the latest land to be added to Walt Disney World. It comes in at a rather small 11- acres. The neighboring Star Wars: Galaxy’s Edge is quite a bit larger at 14 acres. 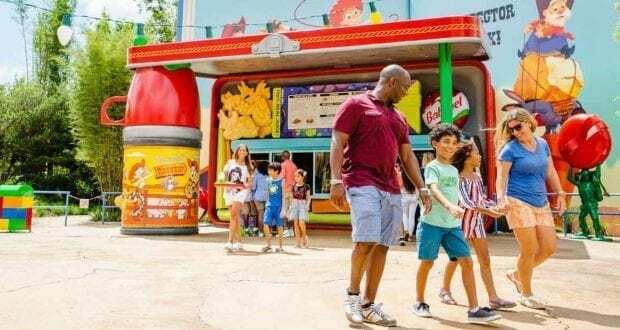 Because of this size, there is only one place to get food inside Toy Story Land and that is Woody’s Lunch Box. At this time, there are also no food carts. Those are still outside the land in the old Pixar Place. We did find a place to purchase bottles of soda and water in the land. Since there is only one place to eat, you should expect long waits to order food, to receive your food, and to find your table. More on that in a bit. In Andy’s imagination, even toys have to grab a bite to eat now and then. He took a vintage Woody-themed lunch box and propped it open with a giant thermos to create a picnic for his Green Army Men. While Andy’s away, Woody’s Lunch Box serves up tasty meals and old-fashioned soda floats. Guests may even spot Sarge in a nearby lookout tower, standing watch for Andy’s return. The whole area is filled with bright colors, lots of Army Men, and chairs made out of cheese! It’s all very creative. The theming is great and fits in very well with the rest of the land. Our only complaint is that the seating area is outdoors, and it is very small. But since we’re having a picnic in Andy’s backyard it makes total sense that the seating would be outdoors. Disney has added umbrellas to the seating area to help with the lack of shade in the area. We visited Woody’s Lunch Box on the second day the land was open for dinner. Every table was full, and we had to wait awhile to grab a table. I also noticed that they added many tall tables that people could stand at to eat. This is necessary because outside of the seating area, while there are a few creative benches (made out of popsicle sticks and dominos), it would be a challenge to find a comfortable place to sit and eat. So, when coming to dine here, be prepared that you might have to stand to eat, and you’ll have to deal with whatever weather Central Florida is throwing at you. Another surprise is that there are only two ordering stands. This makes the whole ordering process very slow. You’ll definitely want to use the Mobile Ordering on the MyDisney App to skip the whole ordering process. This will allow you to order your food ahead of time and then get your food when you arrive at Woody’s Lunch Box. We decided to wait in line to get the full picture of what the service was like. At the time it appeared the wait wasn’t too long. We waited about 5 minutes to order. Two people in our party made special requests to their sandwiches (no mustard). We were told that it would take about 10 extra minutes to receive our food because of the special order. We will not do that again. It actually took about 15-20 minutes to receive our food. Our recommendation is to pick something on the menu that you feel you can enjoy without any special modifications. Even without the requests, most guests waited 5-10 minutes to get their food in addition to their wait just to order. Chad said it best when he said it may be counter service, but that doesn’t mean it’s “quick” service. Hopefully, since this was only the second operating day, the service may speed up as cast members settle in. For now, be forewarned that you may need to give yourself and your party extra time to eat here, especially if you have a FastPass coming up. Finally, the Disney Dining Plan is accepted at this location. Even with the wait, the good news is the food was delicious and unique to anything else you can find on property. There is a lot of variety and the sandwiches are surprisingly large with a lot of meat. The sides are quite small, but everyone in our party was too full to finish them. 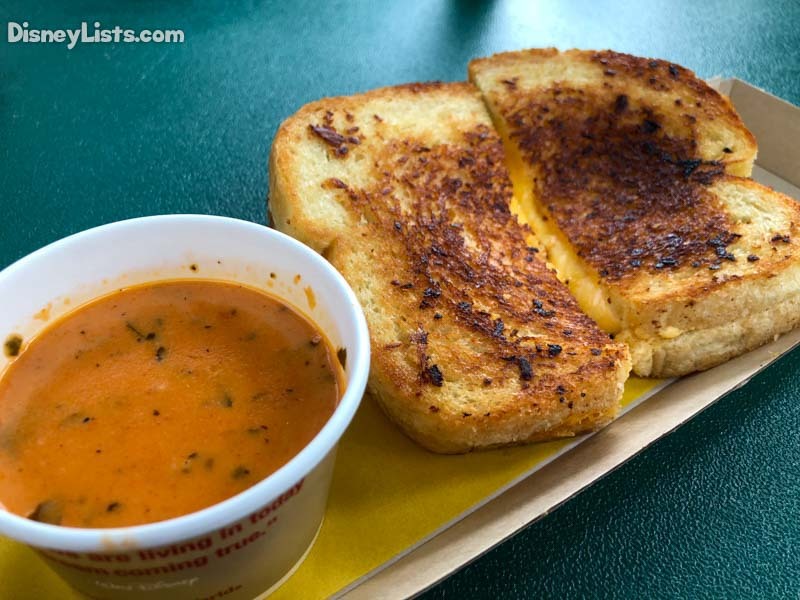 To ensure a soft gooey middle, Disney chefs created a sharp cheddar cream cheese spread, layered in provolone and cheddar and wrapped the sandwich in garlic butter-grilled French bread. This was delicious and is probably our favorite sandwich on the menu! 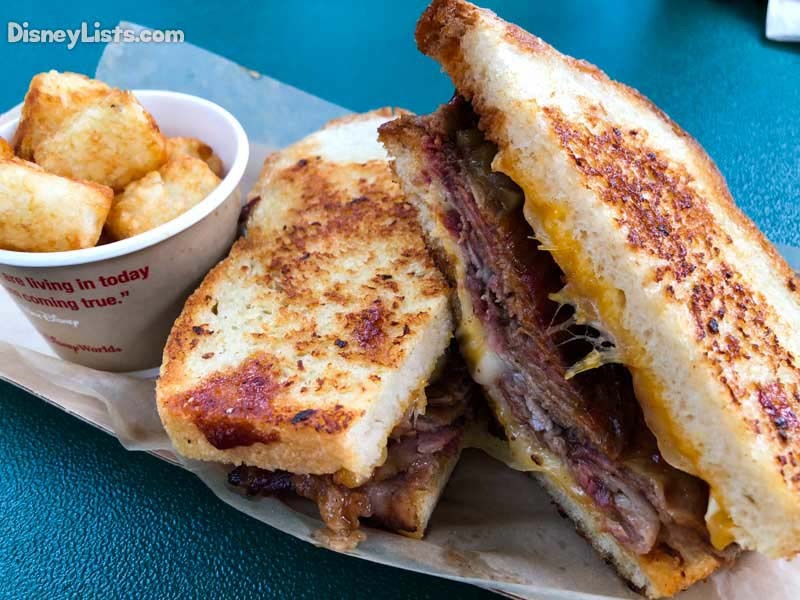 With a nod to cowboy Woody, this Texas-style smoked brisket features cheddar, Monterey Jack, pickles, BBQ sauce and garlic butter-grilled sourdough. This sandwich was also great. This bite-sized treat combines potato barrels, corn chips, chili, and queso. 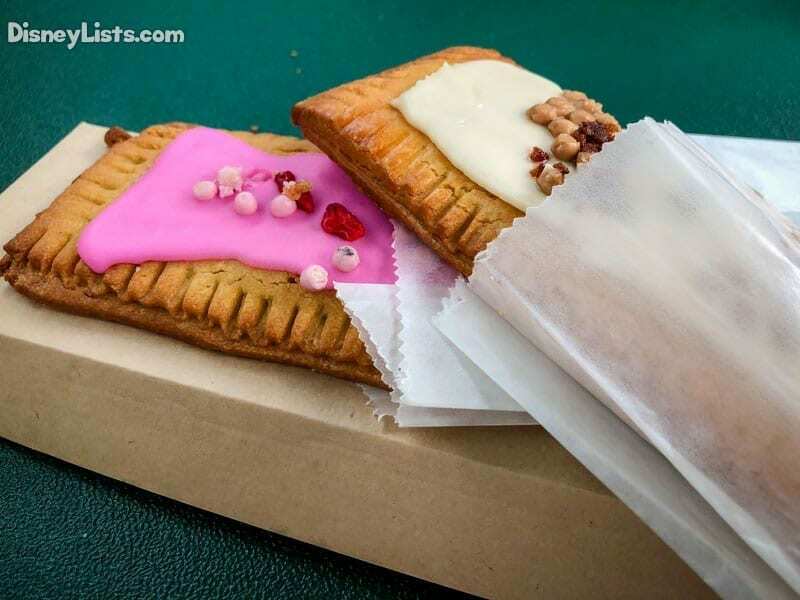 A modern interpretation of a breakfast toaster pastry as a hand-held dessert, these feature a uniquely delicate crust. Layer in high-quality ingredients for fillings, add a decorative garnish, and these tasty tarts beat anything Mom ever packed. Choice of Raspberry Lunch Box Tart garnished with Icing and Dried Fruit or Chocolate-Hazelnut Lunch Box Tart garnished with Icing and Caramelized Bacon. We have to note that these tarts are the best items on the menu. The Chocolate-Hazelnut Lunch Box Tart is absolutely our favorite. It’s nothing like a Pop Tart! The crust is soft and crumbly and the flavor throughout is great. These tarts are available as a breakfast item or a dessert on the lunch and dinner menu. Smoked Turkey Sandwich – The quintessential lunch-box staple with tomato and lettuce on multigrain bread; to give it a kick, Disney chefs add a creamy Dijonnaise. We didn’t get a chance to try this one, but it’s next on our list. The saw some at other tables and the amount of turkey on the sandwich was impressive! Overall, we really enjoyed our dinner at Woody’s Lunch Box. We understand on the second operating day, service might be slower than usual. The food choices are great, and this will likely be our go-to place for quick service at Disney’s Hollywood Studios. We’ll be using Mobile Ordering from now on, which will really help cut down on the wait. We highly recommend Woody’s Lunch Box. Be sure to check it out and let us know in the comments what you think!